That quote by Lee Iacocca says it all. Building a successful business is all about building your people. We all spend countless hours looking for talented individuals to help us with our businesses, especially techs. The talent pool in this industry is not as deep as it was years ago, which makes the search that much more difficult. But what happens once we hire them? Do we do an effective job of setting expectations and communicating? Do we do an effective job of motivating and rewarding them? Payroll is the largest expense item in the monthly financials, and dramatically affects the bottom line. It’s so easy for this to get out of hand if not monitored on an ongoing basis. There are benchmarks in the industry, and this is one of the most important. The objective should be 45% to gross profit. This includes total cost of store payroll including payroll taxes. Using gross profit is important. Using sales can be misleading, especially if your prices fluctuate. It’s easy to get lulled to sleep when you are controlling payroll dollars and change your pricing strategy to build sales. As sales increase, margins can many times stay the same. If you are measuring payroll dollars against sales, the expense can go up and your bottom line will shrink. Payroll needs to be front and center every week. Overtime can be a silent killer if you don’t watch it closely. In the chart below, column one shows a store that is on the benchmark gross profit and payroll objectives. 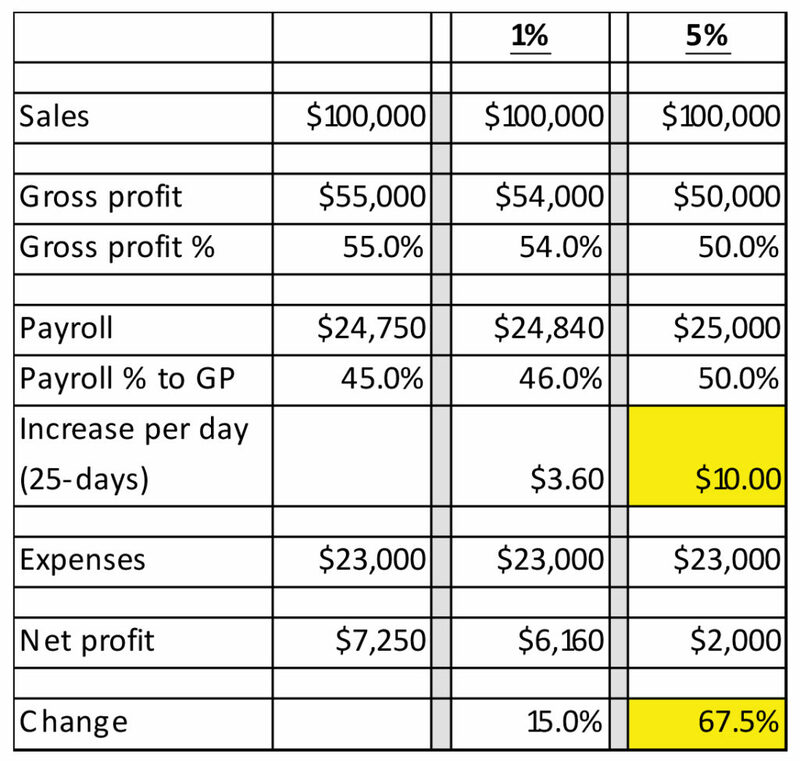 Column two shows what a 1% decrease in gross profit and a 1% increase in payroll expense will do to the bottom line. Column three shows the impact a 5% decrease/increase will have. Note what the minimal payroll increase on a daily basis. A little can make a huge difference. Let’s go back to Iacocca’s quote. He has four key points that are so important. This starts with a job description, which your business should have for every position. Aside from the HR compliance reasons, this sets expectations. Accompanying this should be sales-productive objectives, procedures, shop rules, etc. It’s hard to hold employees accountable if there is nothing in place to measure against. I also suggest posting a schedule for all your employees and ensuring that everyone uses a time clock. Once again, aside from HR compliance, this is paramount to controlling the hours worked. In my last article, I talked about controlling the 1%s. When hourly people punch in and out, an extra 5-10 minutes a day can easily add up to extra payroll and possible overtime hours as shown above. I am a big believer in sharing information with my team. It can be hard for people to understand a relentless push from management to produce more. Employees see cars come in and out of the store and money change hands, so they can easily form the opinion that all this money goes into the owner’s pocket. This is far from the case. If employees understand what it costs to turn the key and open the doors every day – and how much business it takes to cover the expense – I believe that they will embrace the challenge and work harder to achieve it. Break this information into the lowest common denominator. It can be hard to grasp the monthly expense number, but it’s easier to comprehend if broken down into the sales required every day or even by vehicle. I suggest sharing the objectives and performance with your people. This can be as simple as posting a daily tally of sales next to the time clock. Get them excited when things are going well, and encourage them when you slip behind the goal. Motivation is not always about money. Consider a weekly challenge; if the team hits the objective, throw some burgers on a grill and serve them lunch or set a team challenge if you have multiple stores or a large enough staff. It’s about getting the team involved and excited. Ultimately, we all work for a paycheck. People want to feel fulfilled at their jobs and happy with the surroundings, but in the end, it all comes down to money for our employees. If everyone was paid a flat salary, complacency would soon set in and business would suffer. Establish performance objectives as an opportunity for your employees to make more by achieving them. In addition to managing payroll dollars, you must also focus on tech productivity. Nothing grinds on an owner/manager more than looking at empty bays and employees standing idle. In a perfect world, an employee will be productive 100% of the time (1 hour on the clock = 1 billable hour of labor in the automotive world). We don’t live in a perfect world, so we need to strive for something greater. The objective should be at least 1.25 billable hours for every 1 hour on the clock. But if you’re not at this number, you’re not alone. The last national average I saw was that the automotive aftermarket is about 67% productive. There are a lot of factors that will have an effect on productivity – problems with the repairs, waiting for parts, comebacks, etc. At the top of the list (in my opinion) are proper vehicle scheduling and a good tech incentive program. There are different opinions on scheduling and on taking walk-in traffic. I’ve come to believe that it is not an exact science; you need to develop what works best for your shop. I personally feel that there needs to be a schedule. Time is of concern to all of us these days, and customers like to know that they will be taken care of when they walk in the door. Nothing grinds on them more than seeing their vehicle sitting outside because things are backed up in the shop. It’s inevitable this will happen, but knowing how much time a repair will take and setting aside the required time will help minimize things. Techs also like knowing what they have scheduled so they can better plan their day. 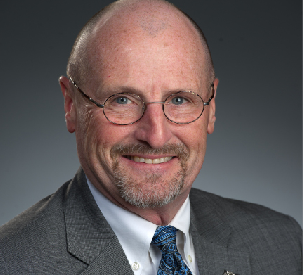 There must also be an established process for courtesy checks, parts and labor look-up, developing and selling the estimate for additional work, ordering the needed parts, etc. All of this takes time and affects productivity. Communication is so important – especially to keep abreast of what’s going on in the bays. As owners/managers, we need to manage the shop and vehicle flow, and not let it manage us. Developing a solid technician incentive program is the other key piece. This can be an entire workshop on its own and can take many different directions. The one constant in all profitable shops is that they pay techs on performance (turning more billable hours). “Work fills the time available,” meaning if I’m paid a flat hourly wage, I’ll find things to keep me busy during the time I’m on the clock. Those hours may or may not be productive, and they have no incentive to work faster or harder. To be on 100% commission, similar to a flat rate, can make it tough to attract the best techs. A hybrid of this has worked well for me where you pay the tech an hourly wage while they are on the clock, then when they hit a set number of billable hours in the week, the hourly rate increases back to hour No. 1. • When they have turned 35 billable hours during the week, that hourly rate jumps to say $17.00. • When they have turned 45 billable hours, that hourly rate jumps to say $19.00 (don’t forget overtime). Don’t get hung up on the hourly rate, just the overall concept of creating an incentive. This is by no means the only or even the best way, just an example of what has worked for me. Don’t forget parts in this mix as well. You don’t want to create a program that will stress labor only and rebuilding something versus replacing it with a part for less money and time. This is another piece of the puzzle, and if managed effectively can have a huge impact on your bottom line.